The TableView class is defined in the javafx.scene.control package of JavaFX API. The example uses Java SE 7 and JavaFX 2.2. This article’s example is built in two steps. FxTableViewExample.java: This is the main program with GUI, application logic and the data. 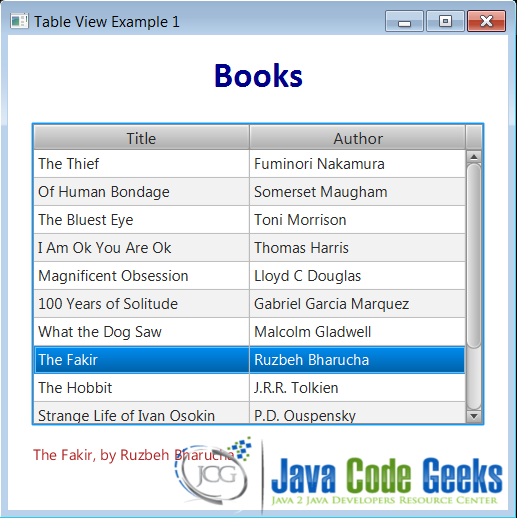 Book.java: This represents the book properties for the table view. The book data for the example is built within the application. This class has two properties – title and author. Both are of String type. Note the Object class’s overridden toString() method returns a string as “Book title, by Author name” (for example, “The Hobbit, by J.R.R. Tolkien”). The detailed description follows the code below. The Stage class is used to construct the main window of the application. The VBox lays out its child controls in a single vertical column. The Label is used to display the “Books” title within the main window. The TableView is used to display a vertical scrollable table of books from which the user can select. The Text is used to display a status message. The controls (widgets) are placed in the vbox in the following order: the books label, table view and the status text. The table view related code follows. The table view is populated with data from an ObservableList collection. The table’s data is created within the program. The getInitialTableData() method creates Book instances and returns them as ObservableList<Book>. A TableView is made up of a number of TableColumn instances. Each TableColumn is responsible for displaying (and editing) the contents of that column. Table column also contains the properties to size/resize the column width, set header text, sorting the column contents, etc. In the above code the column header (text shown in the column header area) and the column cell value factory (which is used to populate individual cells in the column) are set. The following code adds the columns to the table and sets the preferred size for the table. The TableView.CONSTRAINED_RESIZE_POLICY field ensures that any extra column space in table will be distributed among the visible columns to occupy the table width. 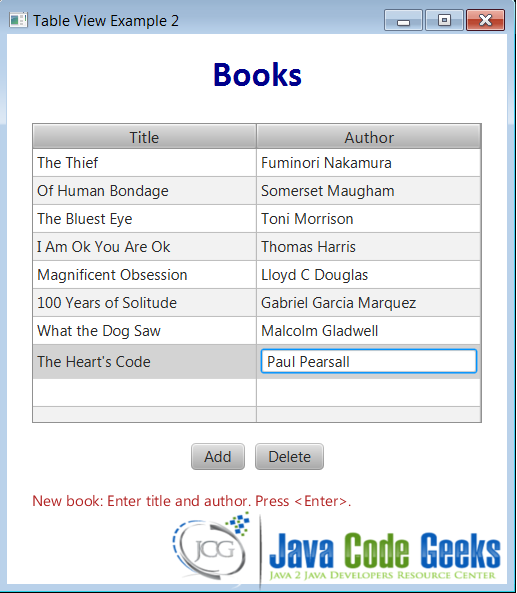 When a table row is selected, the row’s book title and author name are displayed in the status text. Scrolling: As the table rows grow more than the height of the table, the table gets a scroller to scroll the table rows. Sorting: The table rows can be sorted by a column, for example by title column. Click the column header to sort in ascending order and click again to sort in descending order. Reorder and resizing of columns: The column width can be resized by moving the column separator. The column position can be changed by dragging the column header to a required position. Table cell editing: The table cells are not editable (read only), by default. These property functions can be observed in the running example. The table view example program is enhanced to have editable table cells and functions to add, update or delete table rows. This user can click a cell of a selected row, and the cell becomes editable (like a text field). The data in the cell can be changed. Note that after changing the data it is required to press the <Enter> keyboard key to make the data permanent. A Button control is added to the GUI for adding a new row. The button is associated with an event handler. The user clicks the Add button. The action creates a new Book instance with empty properties and adds it to the table data model. The new row is added to the table view. Then, the table view’s TableViewSelectionModel and TableViewFocusModel API allows the program to select and focus on the newly added row. The new row cells can be edited as needed. An event handler of type ActionEvent is used as a button’s action event handler. The interface EventHandler<ActionEvent> is implemented for this purpose. The button’s handler property is set as button.setOnaction(someHandler). This is common for both buttons in this example – add and delete. A Button control is added to the GUI for deleting a selected row. The button is associated with an event handler. The user clicks the Delete button. The action deletes the selected row from the table and the book is deleted from the table data model. NOTE: Note the last row of the table. It is a new row being edited; the title column value is already entered (“The Heart’s Code”) and the author column shows the cell being edited.